������ Prachin Buri used to be a very prosperous town with beautiful waterfalls and canals which are very popular among nature adventurers. Prachin Buri has an alternative climate of both dry and damp. Tropical rain in the southeast monsoon season causes damp and rain throughout the season. Northwestern wind in cool season causes dryness. There are 3 different seasons: rainy, during June October ; cool, during November - February; and dry, during March - May. The average temperature of the year is approximately 27 - 30 degree Celsius or 83 - 88 degrees Fahrenheit. By car: There are many routes from Bangkok. Using Phahonyothin Highway, to Rangsit, and keep left to use overpass to Highway No.305, parallel to Khlong Rangsit, pass Ongkarak of Nakhon Nayok. Then use Highway No.33 (Nakhon Nayok Prachin Buri), turn right at Samyaek Nong Cha-om at Km.155 to Highway No.319 to Prachin Buri. Total distance is 136 kilometres. Using Phahonyothin Highway (No.1) to Wang Noi of Ayutthaya, turn right at Km. 90 to Highway No.33 pass Wihan Daeng of Saraburi, and Nakhon Nayok, turn right at Samyaek Nong Cha-om at Km.155 to Highway No.319 to Prachin Buri. Total distance is 164 kilometres. Using Highway No.304 pass Chacherngsao, Phanom Sarakham, turn to Highway No.319 pass Si Mahosot, to Prachin Buri. The total distance is 158 kilometres. Bangkok - Hin Kong - Nakhon Nayok Prachin Buri by 1st class air-conditioned bus No.58, 59, from 05:00 to 21:00 hrs., leaves every 25 minutes. The fare is 85 Baht. Bangkok - Ongkarak - Nakhon Nayok Prachin Buri by 1st class air-conditioned No.920, 3 times a day, at 05:00, 10:00, and 17:00 hrs. The fare is 75 Baht. By rail: There is railway service from Hua Lam Pong Railway Station in Bangkok to Prachin Buri everyday, 7 times at 06:00, 08:05, 09:40, 11:25, 13:10, 15:10, and 17:25 hrs. For more details, contact Travel Service Unit of Sate Railway of Thailand at 1690, 0 2223 7010, 0 2223 7020. This oldest and largest Pho tree of the country is located in Wat Ton Pho Si Maha Pho. It has been recorded that, 2000 years ago, the seedling stock of this Pho tree was brought over from Buddhakaya. The tree is about 20 metres in circumference, about 30 metres in height, and about 25 metres in diametre. 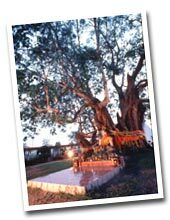 From the legend, Phra Chao Tawa Nam Payadit, the ruler of Muang Mahosot had sent his representatives to Nakhon Patulibut of India for a branch of the Pho tree, under which the Lord Buddha had sat during his enlightenment. Thereafter, the branch had been planted at this Wat Ton Pho Si Maha Phot. This Pho tree has been the symbol of Prachin Buri. On Visak Puja Day, there will be a fair to commemorate this Pho tree. From Prachin Buri town, use Highway No.319 to Phanom Sarakam for 32 kilometres, turn left for 1 kilometre. Situated in Wat Morakot, Tambon Kok Thai, these are the the gigantic Buddhist sites. The most fascinating attraction is the largest and oldest Lord Buddhas Footprints which were carved on the natural laterite floor. Also, there are the Wheel of Dhamma in the middle of both soles. These Footprints were dated between 13th to 15th centuries B.E. Moreover, there is Sa Morakot which is a rectangular pool, 115 metres long, 214 metres wide, and 3.50 metres deep, with the total area of about 25 Rai. It is assumed that this pool was dug as a reservoir. In this area, there are also Sa Bua La, and Exhibition center for Mueang Si Mahosot ancient venue. Traveling: Using highway No.319 (Prachin Buri Phanom Sarakam route) for about 23 kilometres, then turn left for 500 metres. Situated in Ban Khao Noi, Tambon Bu Fai, this waterfall has the stream of about 400 metres long which runs pass rocks, with suitable areas for swimming. Using the same route to Takhro Waterfall, turn left at 14th kilometre, for about 1.5 kilometres. Lan Forest and Rest Area Being the last natural palm forest, near the Parks Office, the rare palm trees in this area have yellow flowers during April and June. In the Park, there are also dry dipterous carp forests and rainforests which are the habitats of wild animals, and a variety of species of birds. The Rest Area of 20 rai has many palm trees, and other plants. Heo Nok Kok Waterfall About 8 kilometres from Ban Thap Lan, this waterfall is beautiful in the rainy season. Thap Lan Reservoir This reservoir is one kilometre from Ban Thap Lan. Surrounded by mountains, and cool climate, this site is suitable for relaxation. Huai Yai Waterfall Located in the west of the Park, this large and beautiful waterfall is 50 metre high and 30 metre wide. Traveling: Using highway No.304, at 79th kilometre, go for another 6 kilometres. The waterfall is in in Wang Nam Kheo, Nakhon Ratchasima. In dry season, the waterfall can be reached by car. Traveling From Kabin Buri, use highway No.304 (Kabin Buri Nakhon Ratchasima route) for 32 kilometres. The Park is 90 kilometres from Prachin Buri and 107 kilometres from Nakhon Ratchasima. These rapids are in the Sai Yai River, which originates in Khao Yai National Park in Amphoe Na Di. There is a strong whirlpool that requires quite an effort by skilful oarsmen to clear the hazard. The trip takes one hour through the rapids before running into smooth water about 2 hours towards the end of the journey. Raft riding is possible here during the rainy season from June to October. Kaeng Hin Phoeng rafting trips are organised by resorts in Na Di district. Located in Tambon Wat, the park is the place for various kinds of thousands birds. The best season to watch the birds is during July to April. The accessibility to the park is by using the same road to Wat Bot but taking the right turn at the intersection. The park is 18 kilometres from town. This temple is located on the west of town, on Bang Pakong River coast. Starting from Thetsaban Damri Road to Suwinthawong Road (Highway No.319), go straight to Highway No.3071 for 4 kilometres. There are 3 Buddha images along the coast named Phra Siri Mongkhon Nimit, the walking Buddha; Phra Sapphasit Nawa, the sitting Buddha; and Phra Maha Chin Saiyat, the reclining Buddha. The atmosphere in the temple is quiet and very shady. Located about 200 metres at the back of Prachin Buri City Hall, this archeological museum is set to be the center of artefacts in 7 provinces: Prachin Buri, Nakhon Nayok, Chacherngsao, Chonburi, Chantaburi, Trad, and Rayong. The Museum displays important artifacts discovered from ancient cities in Davaravati Period. Thai arts in various periods were also displayed for comparative study, including artefacts found under sea water from Koh Kram, Chonburi. Moreover, the temporary exhibition at special occasions has been on display. The Museum service hours are during 09:00 - 16:00 hrs., everyday except special holidays. The admission fee is 150 baht. More details are available at Tel: 0-3721-1586. The temple is located on the right coast of Bang Pakong River in Prachin Buri Municipal Area, 2 kilometres east to town. Being an old and major temple, the place was built in 1879 by a Prachin Buri millionaire. In 1918, Chao Phraya Abhaibhubate (Chum Aphaiwong) constructed a new chapel (ubosoth) which had an architectural design of mixed arts styles of Thai, Chinese, European, and Cambodian. The significant attractions are the Ramayana mural paintings on the exterior of the chapel, while the interior are ornated by the paintings of the legend in Buddhism by the royal artists of King Rama VI. In front of the chapel is a concrete building with the style of Greek or Roman dome. Moreover, within the compound, the temple also features a holy scriptures library, and 3- facet meeting hall (sala) at the pier with shaded atmosphere. Located in Tambon Noen Hom with the distance about 100 metres from Noen Hom - Khao Yai Highway, and about 25 kilometres from Muang District Office, this waterfall has plenty of water during the rainy season. Located at Noen Hom Intersection, 8 kilometres north to Prachin Buri by Highway No.320, this shrine houses the image of King Naresuan the Great in a standing position to commemorate his camping at Prachin Buri on the way from Ayutthaya to Cambodia. People in Prachin Buri and nearby provinces normally pay respect to this shrine. The building is located in Chao Phraya Abhai bhubate Hospital on Prachin Anuson Road. It was constructed by the budget of Chao Phraya Abphaibhubate in 1909 as a residence for King Rama V on his royal visit to Prachin Buri. Its architecture is a 2-storey Renaissance building with the front porch featuring a central dome. Floral design ornated the outside walls, doors and windows. The inside is decorated in a western style. Supervised by the Department of Corrections, the garden is located in Tambon Noen Hom with the area of about 300 Rai. This place has the collection of various kinds of bamboo to study. From Highway No.33, turn left at Noen Hom Intersection to Highway No.3077 (Noen Hom - Khao Yai) for 11 kilometres or 20 kilometres from town. Huai Kasian Waterfall It is located about 15 kilometres from Prachin Buri town. At 166th kilometre, in Ban Khon Khwang, Tambon Dong Khilek. Turn left for about 4 kilometres to the waterfall. Si Mahosot Ancient Towns Located at Ban Khok Wat, Tambon Khok Peep, these sites were constructed in the Davaravati Period, with oval shape, and the area of about 700 Rai. There are moats, earth walls, and more than 100 interesting ancient venues. Most of the archeological materials are related to Hinduism. The most important site is in the center of town. Made from laterites, many materials found were in Lop Buri, Ayutthaya, and Rattanakosin Periods such as Buddha images and pottery. Also, there is Phu Khao Thong a round-shape stupa in the Davaravati Period. Another venue is the Ancient Site No. 25 made from laterite, with rectangular in shape. Sa Kaeo Ancient Site is a square pond, located in the south-west of Mueang Si Mahosot. On the walls of the pond, there are lintels showing 41 animals in the legend. It was believed that the water from this pond is sacred, use in Buddhist ceremony. Traveling: From Prachin Buri town, use highway No.319 for about 20 kilometres, then turn left to highway no. 3070 for one more kilometre, the ancient town is on the right. This waterfall in Tambon Dong Khilek is a popular tourist attraction which run through rocks at different levels. Only during the rainy season that there is water. Surroundings are full of forests. The waterfall is on the same route to Chakkraphong Reservoir but is 700 metres further. ตั้ง อยู่ที่บ้านทุ่งโพธิ์ เป็นรีสอร์ทที่รวบรวมความหลากหลายในเนื้อที่กว่า 2,000 ไร่ มีพื้นที่ติดกับเขาใหญ่ มีพรรณไม้ดอกไม้ประดับนานาชนิด และหลากหลายกิจกรรมกลางแจ้ง พร้อมบ้านพักบริการนักท่องเที่ยว เปิดบริการเวลา 08.00- 18.00น. ตั้ง อยู่ที่บ้านตะคร้อ ตำบลบุฝ้าย น้ำตกตะคร้อ อยู่ห่างจากด่านตะคร้อ ประมาณ 500 เมตร เป็นน้ำตกที่มีลักษณะเป็นแก่งน้ำกว้าง มีสะพานแขวนทอดข้ามน้ำตกตะคร้อ ฝั่งซ้ายของลำธารเป็นเนินเขา ส่วนทางด้านฝั่งขวาเป็นป่าโปร่ง เหมาะแก่การพักผ่อน จากน้ำตกตะคร้อมีทางเดินเท้าต่อไปอีกประมาณ 2 กิโลเมตร จะถึง น้ำตกสลัดได เป็นน้ำตกที่มีความสวยงาม หากจะเดินทางเข้าไปชมน้ำตกสลัดไดควรติดต่อขอเจ้าหน้าที่นำทางจาก หน่วยพิทักษ์อุทยานแห่งชาติเขาใหญ่ 10 ที่ตั้งอยู่บริเวณน้ำตกตะคร้อ โทร. 0 1755 4852, 0 9913 5058 เปิดให้เข้าชมทุกวัน ตั้งแต่เวลา 06.00-18.00 น.